Click image to purchase from Button Me Up’s Etsy Store. A week and a half into our fundraiser, and the steampunk community has really been out there pushing our cause. Thank you to everyone who’ve signal-boosted our fundraiser on their blog, Twitter, Livejournal, website, through word of mouth, etc. I also want to thank the good congoers of Nova Albion who opened their hearts and their wallets to buy a button for Japan when I visited California last weekend. Wondering about our progress so far? See that nifty button on the left-hand corner with the golden Phoenix? That leads to our Rising Phoenix Circle page, which features a list of participants and the amount raised thus far. 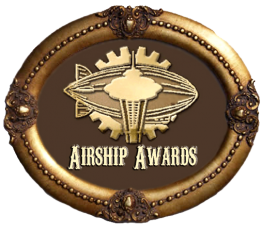 Not only that, but I can start dropping some hints about the FREE STEAMPUNK GIVEAWAYS that are open to anyone who gets a button. Read on after the jump. I’m very happy to announce that we will have THREE PRIZE PACKS that will be raffled off to a trio of lucky donors at the end of the fundraising period in September. …and more to be announced later this summer! 1) Do you want to participate in the giveaway? 2) Do you want to have your name added to the Rising Phoenix Circle? We are psyched that we have been incredibly successful so far, and we’re looking forward to seeing where this fundraiser will go in the next coming weeks! Webster Hall for The Anachronism! Click hear to read our initial announcement with direct links to Button Me Up.